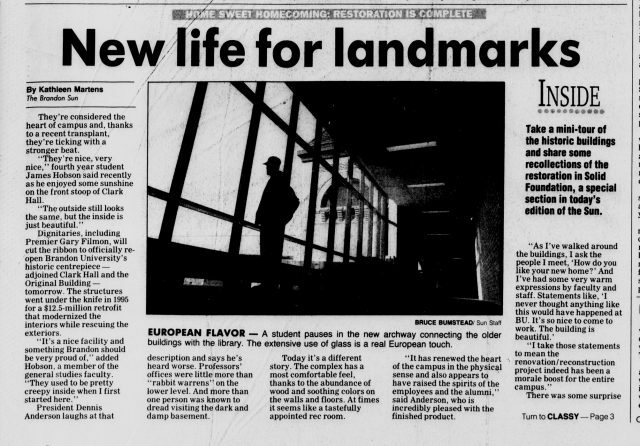 It was front-page news in 1997, when Brandon University re-opened Clark Hall and the Original Building. 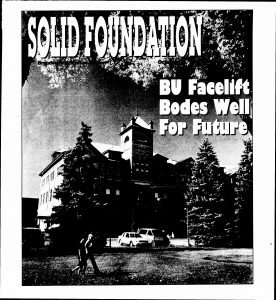 Twenty years ago this week, Brandon University re-opened the doors to its original Brandon College building and the attached Clark Hall, with students, factually, staff and alumni streaming into a completely renewed structure, after a two-year, $12.5 million retrofit. Click image for special-section PDF. Last fall, Clark Hall also marked 110 years since its original construction. It opened in 1906, five years after the Brandon College Original Building, in 1901. Each originally cost about $40,000 to build, on land that was originally purchased in 1899 for $300. They are provincially designated heritage structures that remain Brandon’s oldest public buildings still in continuous use. The grand re-opening of the buildings, in 1997, was marked with a ribbon-cutting ceremony, an open house and tours, along with Homecoming 1997 celebrations. The Brandon Sun produced a 12-page special section and covered the re-opening with a front-page story. This year, Brandon University also celebrates 50 years since receiving its charter as an independent university, able to issue its own degrees. Today, Brandon University is once again entering an ambitious new era of growth, with a transformative downtown initiative and a new Campus Master Plan. 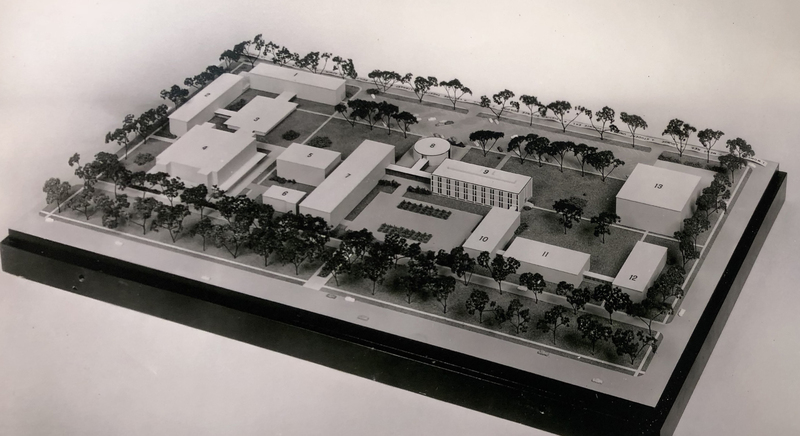 This unbuilt 1967 plan called for the Brandon College Original Building and Clark Hall to be razed entirely. A special exhibition, on now in the Tommy McLeod Curve Gallery, explores the full history of building development, demolition and redevelopment on the Brandon University campus, plus plans that didn’t come to fruition — including one that considered tearing down the Original Building and Clark Hall to make way for an enormous concrete plaza or parking lot.